Your dog has the thrifty gene and, no, it doesn't mean he knows how to find the best deals on dog food with his nose. The "thrifty gene" prepares the dog for the harsh winter and allows for normal performance in cold-weather conditions. Just as the bear knows to hibernate, dogs have instincts that get them ready for the seasons. Shorter days signal to the dog's brain that winter is coming. This sets off hormonal changes and slows their metabolism. It's a natural occurrence. With the cold weather on the way your dog's body naturally prepares itself but how much you feed it is important too. Studies have shown that dogs that live in low temperatures need two to three times as many calories as they need at a more moderate temperature. That increase in calories leads to more fat accumulation and insulation, helping to compensate for the calories that get lost due to shivering. Dogs and humans need to keep a constant body temperature. Shivering is a way to do that but shivering uses a lot of calories. If these pets don't have sufficient calories they will lose weight. Dogs that live outside in the winter need more fat in their diet. Which may mean that you switch foods in the winter to one that has a higher fat content. The amount of extra calories required will vary between 10% and 90% more than normal. Dogs that live inside when the temps start dropping and don't get as much exercise as they did in the warmer months will start to pack on the pounds and it's not so easy to get that extra weight off. So if you aren't as active with your dog and your dog lives inside, you should cut back on the food a bit so they don't gain weight. One thing that is crucial in a dog's diet is water. No matter how cold it is dogs still need to be hydrated. 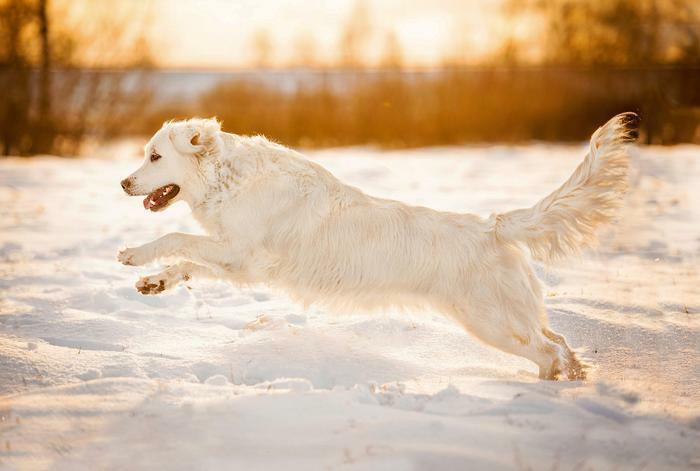 Dogs can dehydrate just as quickly in the winter as the summer. Always check the water bowl outside and break the ice off if you have to. Snow is not a substitute for fresh water. Whatever else you do, keep your pet as active as you possibly can. If your dog is in good condition, it's likely to live longer. It depends on you to help that happen. Why wouldn't you want to keep your best friend around for as long as you can?